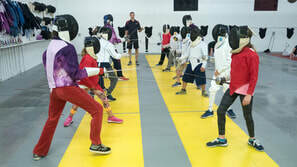 Introduction of students to the sport of fencing. Ongoing Beginner classes introduce and reinforce the basic skills, handwork and footwork. Monthly sessions for $100 per month and include all necessary fencing gear. Annual USFA Non-Competitive Membership is required ($10 additional). Monthly sessions focused on conditioning, competitive footwork, handwork coordination reinforcement, combination actions. Tactical and technical drills are augmented with conditioning and strength training drills. Students must own competition equipment. Nova Fencing Club and USFA Competitive Memberships are required.